Before we fully revel in all that the 2013 Red Sox are â€“ and son, that's going to take awhile â€“ let's lead off with a quick acknowledgment of what they are not. They are not the 2004 Red Sox, the Jack-sipping pack of Idiots and savants who vanquished the Yankees and 86 years of anguish in the most improbable manner possible. They are not the 2007 Red Sox, a more business-like champion, but rich in talent and vicious in their efficiency, outscoring their opponents by more than 200 runs over the season. And they most certainly are not your father's Red Sox, whose grandest baseball dreams â€“ in 1967 and '75 and '78 and '86 and other Octobers gone cold â€“ proved beyond the cruel grasp of possibility. But your great-grandfather's Red Sox? Well, now we may be onto something, and not just because those beards could be straight out of a sepia-tinted 1918 Red Sox team photo. For the first time in 95 years, the Red Sox clinched a World Series title on their own soil Tuesday night. Appropriately, it was John Lackey, who authored his own personal redemption tale this season, earning the final unforgettable victory in the franchise's own season of redemption. Shane Victorino delivered a three-run double, Stephen Drew homered, and the Red Sox knocked around Cardinals phenom Michael Wacha in their clinching Game 6 victory. It is their third World Series title in 10 years, and how many of our forefathers would believe that? This dream did not prove impossible. But given where this franchise was perceived to be when players began arriving in Fort Myers, Florida in February, what they accomplished is as improbable as anything that came in the seasons before. Maybe it's that we're in the midst of reveling in the moment and thus prone to hyperbole, but right now it feels like that includes winning four straight against the Yankees in October 2004. This is the rare champion that can bring out the no-one-believed-in-us mantra and be telling the flat-out truth. Among 134 writers from the Globe, Boston.com, Sports Illustrated, ESPN, FanGraphs and Baseball Prospectus, only nine had the Red Sox making the postseason, and one picked them to win the AL East. Me? I liked them. And I had them getting edged out for the second wild card by the Blue Jays. To be fair, any immediate faith would have seemed a blind wish at that point. The Red Sox were coming off a season and a month of pure, lousy baseball misery. They had let an almost certain playoff berth slip through their greasy fingers in October 2011, winning just seven of their 27 games in September as a disconnect between manager Terry Francona and his players proved fatal. There was no solace or recovery to be found in the next season. With Bobby Valentine â€“ the wrong man at the wrong time with the wrong team in the wrong city â€“ at the helm of a team buried by injuries and unnecessary aggravations, they won just 69 games and became an afterthought on the New England sports scene before the leaves began to fall. But there was one blessing, and it was so significant that it's right to say this season doesn't happen without it. The first twist of good fortune actually occurred before the final pitch of last season had been thrown. While the Red Sox were playing out the string on 2012, an extraordinary opportunity to start fresh in 2013 presented itself out of the Dodger blue in late August, when the Los Angeles Dodgers reached out to Red Sox management about the availability of first baseman Adrian Gonzalez. The deal that was ultimately consummated redefined the modern concept of a baseball blockbuster. The Red Sox sent Gonzalez, the talented, dispassionate first baseman, pitcher Josh Beckett, outfielder Carl Crawford, and utility infielder Nick Punto to the Dodgers. In return, they got five players -- including prominent pitching prospects Ruby De La Rosa and Allen Webster -- and $265 million in salary relief. It was the ultimate fresh start, and despite some cloudy-eyed pleas from short-memoried segments of fans and the media to pursue free-agent stars Josh Hamilton and Zack Greinke, general manager Ben Cherington went about a more disciplined and nuanced plan. Rather than throw mounds of new-found cash at another star or two and repeating the vicious cycle, he set about filling in a top-heavy roster with respected, accomplished, unsung veterans who all had one thing in common long before the unifying beards: they had made a habit of playing on winning teams. The blueprint proved brilliant. The first to sign on was David Ross, the affable, pitcher-whispering catcher, in mid-November. Then came Jonny Gomes on the first day of December, and Shane Victorino a dozen days later. Then came Koji Uehara, who submitted a season that left Dennis Eckersley, a pretty fair closer in his own day, in reverential awe. Before December was through, Cherington would add Ryan Dempster and Stephen Drew, and Mike Napoli signed on for a year in January. Most were essential. All contributed. But this wasn't just the renovation work of the newcomers. It was easy to forget while looking away from the tattered remains of the 2012 season, but there was top-notch talent on this roster. To a man, the returning core of high-quality players -- David Ortiz, Jacoby Ellsbury, Dustin Pedroia, Jon Lester, and Clay Buchholz â€“ all had better seasons than they did a year ago based on the statistic Wins Above Replacement. Was there good fortune along the way? Sure. Who expected Ortiz, who played just 90 games last season because of an Achilles' injury that lingered into this year, to stay healthy, let alone submit a vintage season, walloping 30 homers with a .959 OPS. Jon Lester, under the familiar eye of manager John Farrell (one cannot praise him enough for his effect on the culture), restored his ace status and then some. Pedroia played and played well through an Opening Day hand injury that would have sidelined players of lesser motivation. And when starters did need a day off â€“ or even a two-week stint on the disabled list â€“ the depth Cherington accumulated made it survivable. So many ifs were answered in a way that even the most optimistic Red Sox fan wouldn't have dared hope. But the players, they believed early. To a man, they'll tell you now that they knew in Fort Myers this combination of players was going to gel into a hell of a team. Pedroia was always at the forefront. "Our goal is to win the World Series every year," Pedroia said in February. "If we come into camp and that's not the goal ... I know everybody thinks that's not our goal right now, but it is." 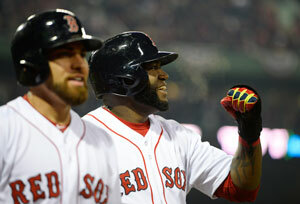 They excelled out of the gate, with Mike Napoli driving in 27 runs in the 18-win April while Ortiz made his way back. Early May brought a hiccup â€“ they lost 9 of 11 at one point â€“ but recovered to finish the month at 15-15. It was their worst month of the season. Those caterwauling that they weren't this good were left to devour their own words in an angst-free September in which the Red Sox pulled away, ultimately finishing with 97 wins. The Rays were runners-up in the division and a four-game speedbump in the wild card round. The Tigers had phenomenal pitching, an ailing slugger, and so many flaws to be exposed in the six-game ALCS. The Cardinals were a worthy World Series foe. But just as in 2004, the banner they were left to wave said National League Champions, a prize to be sure, but one of small consolation. What's funny, or miraculous, or just kind of amazing, was that the Red Sox won a championship in what truly was a bridge year to the next generation. Xander Bogaerts arrived early and delivered late, and I think we're all down with watching this kid for the next 15 years. Hell, this is a night of optimism. Make it 20. But this isn't about the future. Thank goodness it's not about the past. The Red Sox, in this remarkable season of redemption, are World Champions. The only disappointing thing about this year's talented, deep, unified, and very woolly team? That we don't get to watch them anymore. But that's OK. Because Wednesday night was the culmination of a season that no one fortunate enough to see it is ever going to forget. World Series Game 6 chat at 7 p.m.
An easy-to-install widget to get the list of our latest links on your blog (or your iGoogle page). David Ortiz has done it again!